South East Adventure I Kenia · Tansania · Malawi U.A. Erlebe Afrika im Overland-Truck! Bei dieser spannenden Campingtour von Kenia bis zu den Victoria Falls erwarten Euch unvergessliche Begegnungen mit Mensch, Tier und Natur in diesen unterschiedlichen Ländern. Beobachte Afrikas Big Five auf Safaris in der Masai Mara, der Serengeti und im Ngorongoro Krater. Weiße Sandstrände laden zum Entspannen auf der Gewürzinsel Sansibar und am Malawi See. Diese Regionen sind auch ist ein Paradies für Wassersportler und Taucher! Der Anblick der donnernden Victoria Wasserfälle ist beeindruckend und hier werden zahlreiche Abenteueraktivitäten angeboten. Kombiniert mit Busch-Camping und geselliger Atmosphäre in internationaler Gruppe wird diese Abenteuerreise zum unvergesslichen Erlebnis. Die Übernachtung auf den Campingplätzen erfolgt in großen 2-Personen-Kuppelzelten mit Überzelt, eingenähtem Boden, Eingang mit Insektenschutzgitter und Schaumstoffmatratzen. Wir verwenden hauptsächlich Campingplätze, die in der Regel vernünftige Wasch-und Duschmöglichkeiten, Strom und möglichst auch einen kleinen Laden, Bar und Swimmingpool bieten. Die Austattung der Campingplätze ist unterschiedlich und hängt von der besuchten Region ab. Die Übernachtungen auf Sansibar erfolgen in Mehrbettzimmern. Das Kochen wird zusammen vom Tourguide und den Teilnehmern übernommen. Es sind 3 herzhafte Mahlzeiten pro Tag mit eingeschlossen (sofern nicht anders angegeben). Der Guide vollbringt wahre Wunder auf dem Campingkocher! Jeder Teilnehmer hilft bei der Zubereitung der Mahlzeit mit. Vegetarier können problemlos verköstigt werden und werden von unseren Kochkünsten begeistert sein. Bei Bedarf können spezielle Ernährungs- und Diätanforderungen berücksichtigt werden. Diese sollten jedoch frühzeitig angemeldet werden. Bitte beachte, dass sich die Preise jederzeit ändern können. We depart the city early and make our way across the Great Rift Valley to the Maasai Mara National Reserve, enjoying views of the vast vista en route. We travel in small specialized safari vehicles that enable us to have a more intimate view of wildlife. We spend two nights camping on the edge of the Reserve with time to explore the park on morning and afternoon game drives. The sweeping plains, distant horizons, low slung acacia trees, and plentiful wildlife ensure a deeply evocative few days. The "Mara" is crossed every year between July and October by great herds of wildebeest, zebra and other grazing animals in their migration from the adjoining Serengeti plains to the south (in Tanzania). How long they stay is dependant on rainfall and subsequent grass growth in the rainy season. Predators (such as lion, cheetah, leopard) and scavengers (hyena, vultures) follow the grazing animals and this enormous congregation of wildlife forms a spectacular display of Africa’s natural resource. But the Mara is excellent for game viewing at any time of year and regardless of when you can visit we hope to see some, if not all, of Africa's "Big Five" (elephant, lion, rhino, buffalo and leopard) and an array of other wildlife. We have the day to explore the Reserve in search for wildlife including the ‘big 5’ – lion, rhino, elephant, buffalo and leopard. The sweeping plains, distant horizons, low slung acacia trees, and plentiful wildlife ensure a deeply evocative few days. The ‘Mara’ is crossed every year between July and October by great herds of wildebeest, zebra and other grazing animals in their migration from the adjoining Serengeti plains to the south (in Tanzania). How long they stay is dependent on rainfall and subsequent grass growth in the rainy season. Predators (such as lion, cheetah, leopard) and scavengers (hyena, vultures) follow the grazing animals and this enormous congregation of wildlife forms a spectacular display of Africa’s natural resource. But the Mara is excellent for game viewing at any time of year and regardless of when you can visit we hope to see some, if not all, of Africa’s ‘Big Five’ (elephant, lion, rhino, buffalo and leopard) and an array of other wildlife. We stop for a lunch before returning to our tented camp for the evening. From the Mara we make our way back across the Great Rift Valley to Nairobi, where we overnight. After crossing the border into Tanzania at the busy Namanga frontier we arrive at our destination, Arusha, in the late afternoon. Situated mid-way between Cape Town and Cairo, this is very much Tanzania’s ‘safari capital’ - a bustling city with colourful markets, shops, vehicles and people, all nestling in the shadow of the brooding Mt Meru (4.556 m). After exploring the curio markets, we head to our camp just outside Arusha on the open plains to the west of the city. It is from here that we prepare for our two night/three-day excursion to the Serengeti National Park and the Ngorongoro Crater. This afternoon, if time allows, we enjoy a walk to one of the local Maasai villages to enjoy an insight into everyday life and traditions of this colourful culture. This morning we transfer to smaller, more ‘game park friendly’ vehicles and drive west across the Great Rift Valley, passing through Mto Wa Mbo (‘mosquito creek’) and enter the Ngorongoro Crater Conservation Area. We enter the park and drive around the ‘Crater’s rim and down onto the Serengeti plains. Green after the rains, brown and burnt in the dry, this is home to an enormous variety of grazing animals, predators, and birdlife. Flatter and larger than the Maasai Mara the Serengeti is simply huge - indeed the name derives from the Maasai word Siringitu – ‘the place where the land moves on forever’. We game drive to our designated (but unfenced) campsite for the evening where lion and hyena roam nearby, for an unforgettable experience. We drive out of the plains, game driving en route, and after lunch ascend the outer wall of the Ngorongoro Crater. We spend the night camping on the rim (you may need a jacket; it can be cold at night due to the altitude), where wildlife also roams free. At 326 square kilometres, the Ngorongoro is Africa’s largest intact caldera and a World Heritage Site. If the view from the rim (2400 metres above sea level) is spectacular, the site from the Crater floor (some 600 metres below) is equally enjoyable. We wake early and descend the steep dirt road of the Ngorongoro Crater for a morning of game driving in this spectacular wildlife haven. All of the large mammals are present except giraffe (which cannot manage the steep slopes leading down onto the Crater floor). After our game drive we ascend to our campsite on the rim for a final view over the Ngorongoro Crater, pack up our camp and have lunch before retracing our steps to Arusha and our campsite at the Meserani Snake Park. Note: We may enjoy the Maasai walk on this day if we were unable to make this on day 4. This morning we wake early and head south via Moshi to Bagamoyo. If the weather is clear we will be afforded a view of the magnificent snow-capped Mount Kilimanjaro, Africa’s highest peak (5.895 m). The quaint town of Bagamoyo was founded at the end of the 18th century and was one of the most significant trading ports along the East African coast. Our camp for the evening is situated close by to the palm fringed beaches of the Indian Ocean. Leaving Bagamoyo we make our way south to Dar es Salaam. ‘Dar’ is Tanzania’s main port and is a hub of commerce and industry - a hot, humid and bustling seaport city of high rises, colourful markets and Arab influenced architecture on the coast, accessing one of the most important sea routes in the world. To a majority of travellers, this city is the port of entry to the more exotic island of Zanzibar and other archipelago islands. We set up camp on the beach just outside of the city, take in the balmy Indian Ocean sea breeze, and prepare for our trip to Zanzibar. Evocative and exotic, Zanzibar conjures up images of idyllic, sandy, palm fringed beaches; romantic winding cobbled alleys and lush tropical forests. You will find all of these here – and an intriguing history. Zanzibar was the base of the great 19th century explorers such as John Hanning Speke, Richard Burton and David Livingstone and once was a major trading centre of spices. Indeed, the spice trade here is centuries old: Zanzibaris have traded with the people of the Arabian Peninsula for many generations, navigating the ocean in simple dhow sailboats, relying on the annual trade winds for passage. The Arab influence is evident in the architecture and diverse street stall offerings of the capital, Stone Town. This influence can be seen right along the Eastern coast – the Swahili language itself is a result of the mixing of Arab and African languages and cultures over many centuries. Zanzibar’s other history is not so romantic. The island was also a staging post for slaves bought from the African interior, being held before shipping to slave owners in the Middle East. You can still see the places where these men and woman were held – and even a short visit is enough to convey the appalling conditions they had to endure. Our time on the island over the next 3 nights is not structured and your time is at leisure. Perhaps the best way to see Stone Town is on foot: explore the bazaars for old maritime trinkets, fabrics and wooden carvings, or visit mosques, palaces, courtyards and alleyways of the old town. Spices are grown in plantations nearby and you can take day tours to visit some and have your senses dazzled by the tastes and scents experienced. If it’s white sand, sparkling ocean and hot sun you prefer – head to the northern beaches and enjoy the Indian Ocean at its best. Try snorkelling and diving, indulge in some sumptuous seafood, or simply relax beneath a coconut palm with a cocktail and a good book. NB: As we leave the truck on the mainland, basic tourist class accommodation (B&B) is included but for the sake of flexibility other meals are left for your own account. Typically, we spend one night in Stone Town and the next two nights in the north of the island at one of the beaches. Your tour leader will be available to assist if you if you have any questions or need activities arranged. Please note that some group members may be starting their tour in Dar es Salaam. Both old and new are invited to join in any group outings. Enjoy free time on Zanzibar and transfer to the northern beaches from Stone Town. Relax on the sun kissed beaches of Kendwa, in the northwest part of the island, take an optional diving trip to the rich colourful reefs or grab a snorkel and goggles to explore these from above. Browse markets or enjoy hanging in a hammock with a cocktail and a good book. The beach is a great place to catch up with the locals who will pass by selling their wares, offering henna tattoos and inexpensive massages. Round the day off with a sunset dhow cruise or chilling to the tunes from the nearby beach bars. We have the morning to do any last-minute shopping or enjoy one last swim before catching the ferry back to the African mainland and Dar es Salaam and onwards to our campsite on the coast for the evening. Please note that some group members may be ending their tour in Dar es Salaam. Both old and new are invited to join in any group outings. Leaving the bustling city and warm coast, we drive inland through the Mikumi National Park where we may, with luck, spot forest elephant or giraffe feeding near the side of the road. Our campsite is located a short stone’s throw from the park and we enjoy sundowners at the local bar/ restaurant followed by the evening around the open fire under the blanket of stars. If time allows we can go on an optional game drive in the afternoon to explore the magnificent park – Tanzania’s 5th largest. Expect to see Elephant, hippo, crocodiles, antelope and with some luck some buffalo or lion. We continue our journey heading to the town of Iringa and the Kisolanza Farm. At an altitude of 1.600 m Kisolanza ensures a pleasant fresh climate in one of the most scenic areas in the Southern Highlands of Tanzania. Home to the Ghaui family for over 70 years, Kisolanza remains a working farm providing organic meat (beef, lamb and chicken) and vegetables to the surrounding markets as well as Dar es Salaam. The farm house is a well-known spot to camp and is the overnight near our mid-way point for our journey from the ocean to the Malawi border. After our last night in Tanzania, we head through lush mountain passes, rich grazing land, and banana and tea plantations to the Songwe border post into Malawi. Lake Malawi formerly ‘Lake Nyasa’ covers almost a fifth of the country’s area and provides the source of livelihood for many of the Malawi people. Fishermen, fish traders, canoe and net makers all ply their trade, and a common sight is that of a fisherman in his Bwato, (dugout canoe made from hollowed out tree trunk) fishing on the lake at the break of day. The lake also has the highest number of endemic fresh water fish species of any in the world. NB: Although it is our intention to adhere to the campsites described, a certain amount of flexibility is built into our time in Malawi and the crew may make alterations to the published itinerary. Please therefore treat the Malawi section of the dossier as a guide line only. Relax on the beach, take a leisurely village walk or do the full day trip to Manchewe Falls where, after an 11km hike, you can cool off in a natural bath. The surrounding hills are home to the Livingstonia Mission where David Livingstone worked from for a time while staying in Malawi. The views from here are simply magnificent and well worth the effort of hiking to. For those staying at the campsite, there is a local craft market where you can enjoy learning the ins and outs of woodcarving your own souvenir, or learn to play the game of Bao, haggle for some souvenirs or enjoy a relaxing day admiring the shimmering waters from the beach. Today we take a nice scenic drive through rubber plantations to Mzuzu - the capital of the northern region and the third largest town in Malawi - where we stop for a short while to grab supplies and check out the markets, before arriving to Kande Beach. Try some of the optional water sports typically available, horse riding or else simply relax and enjoy the warm fresh waters of Lake Malawi. There is the opportunity to meet the local people, generally known as some of the friendliest in Africa, to gain insight into their way of life. Today you’ll have some free time to try some of the water sports available including diving, snorkelling, and horse riding along the beach. Or simply relax and enjoy the warm fresh waters of Lake Malawi. There is the opportunity to meet the local people, by tradition very friendly, on an optional guided Village Walk, or you can simply head out and explore the lakeside, craft market and meet some of the locals. Saying our goodbye’s to ‘the Lake’, we head to the border crossing into Zambia to Chipata. Formally named Fort Jamerson, the border town has a population of approx. 98,000, and is the capital of Zambia’s Eastern Province. The town has colourful fruit and vegetable markets and an unexpected number of ornate mosques due to its large Indian community. If time allows, we will stop in Chipata before arriving to our campsite situated a short distance from the town centre. Today we leave early and take the Great Eastern Road through lush country and small villages, cross the Luangwa River to Lusaka, Zambia’s capital. Lusaka is Southern Africa’s fastest growing city with approx. 1.7m inhabitants. 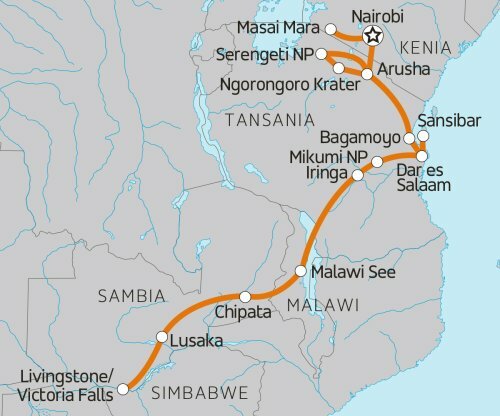 It is located on Zambia’s southern plateau at an elevation of 1300m with four main highways running north, south, east and west to different parts of Africa. Our campsite for the evening is set in a tranquil and relaxing setting on a farm. We head south to Livingstone and set up camp at the Waterfront campsite on the banks of the Zambezi River, just a few kilometres from the Victoria Falls. At various times of year the spray from the ‘Falls’ can be seen from up to 20 or 30 kilometres away, hence the local name Mosi oa Tunya – the ‘Smoke that Thunders’. Don’t forget your raincoat to keep you and your camera dry! The campsite management provides information on all activities available in the area (typically these include rafting, canoeing, bungee, abseiling, gorge swinging, horse riding, scenic flights, river cruises), allowing you to plan your time accordingly over the next four nights. NB: For the sake of practicality, meals in Livingstone are restricted to breakfasts. This allows you to take on half day or full day activities (some of which include lunch) without having to be back with the group at mealtimes. The Waterfront camp restaurant overlooks the Zambezi River and offers a good selection of reasonably priced meals and snacks throughout the day (allow USD15-30 per meal). Relax and enjoy these few days at your own leisure. Alternatively, take a taxi or free shuttle into Livingstone and try the local fare. We have a free day in Livingstone today to explore the town, pop over to neighbouring Zimbabwe or enjoy the many optional activities on offer such as rafting, bungee jumping, river cruises, flights over the falls, just to name a few. Our tour ends after breakfast, but we highly recommend staying a few more days in the area in order to explore the Victoria Falls area to the full. Apart from the adventure activities already mentioned check out the markets, volunteer a day in some worthwhile local projects, or simply relax at the beautiful waterfront and watch the Zambezi River flow quickly past on its way to Victoria Falls. Der Gesamtpreis dieser Reise setzt sich aus dem Tourpreis und dem Local Payment zusammen. Den Tourpreis zahlst du vor Abreise an uns, das Local Payment in US-Dollar zu Beginn der Rundreise an den Reiseleiter vor Ort. Auf Wunsch kannst du den Betrag für das Local Payment auch vorab bezahlen. In diesem Fall gilt der genannte "Prepaid" Betrag in Euro. Die Overlandtrucks sind speziell für die Straßenverhältnisse in Afrika entworfen und von robuster Bauart. Die Trucks sind mit großen Fenstern und 24 vorwärts ausgerichteten Sitzen ausgestattet, so dass Sie nichts von der atemberaubenden Landschaft oder den Tieren verpassen. Die Trucks verfügen weiterhin über Tische, Steckdosen zum Anschließen und Aufladen von Laptops, Kameras und MP3-Playern, Gefrierschrank, Wassertank, Bibliothek, Spiele, I-pod Anschluss und private Schließfächer mit 70-Liter Volumen. Die Campingausrüstung umfasst Campingstühle mit Rückenlehne, Campingtische, eine umfangreiche Küchenausstattung sowie große Kuppelzelte und komfortable Schaumstoffmatten. Das Vortreffen findet am Abend VOR dem Tourbeginn um 18 Uhr im Tourhotel in Nairobi statt. Bitte reisen Sie daher mindestens einen Tag vor Beginn der Tour in Nairobi an. Die Abfahrt in Nairobi ist am Tag 1 um 08:00 Uhr morgens. Über weitere Kombinationsmöglichkeiten informieren unsere Abenteuer-Spezialisten gerne!